What everybody is wearing in Spring ’09…shades of Guantanamo ? Inspired by Anthony Gormley’s installation Blind Light, this unusual art/food project in Ganton St, just off Carnaby St, requires special clothing, a paper boiler suit given free on entry. We soon saw, er felt, why…on leaving, everything, clothes, camera, hair, phone, is covered with a light sticky substance! “Do you feel drunk?” I ask one woman. “Yeah, but that’s because I’ve been drinking” she slurs, drink in hand. A film crew is trying to film in there. Impossible really. It’s a dream-like experience. Shuffling around, all of us in identical white suits, a little disorientated, your breath sticky and short, this reminds me of something… a surreal image springs to mind, unbidden, of the gas chambers…with a party atmosphere. Sounds like a cross between a scene from a Tarkovsky film mixed with a bit of Woody Allen. I think it's the white suits and dreamy bit that made me think of that. Fun blog you've got going. 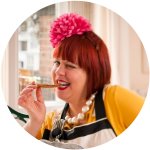 Check out my other blogs too…The English can cook is more about my Underground Restaurant. Travels with my teenager is about the non-food parts of my life. Oh my homeland, what were you doing in Chile? I was there when Pinochet was democratically unelected.The atmosphere was still pretty heavy, teargas in the streets etc. I was just travelling. Went from Arica down to the tip then over to Patagonia onto la tierra del fuego. Fantastic mussels grilled with parmesan in Chile. Visited a few vineyards too. Plucked mussels out of the antartic waters with my freezing bare hands, cooked em up in the national park, with white wine, garlic, parsley. Chilean seafood, what a dream! I grew up 2 blocks away from the beach and ate seafood a couple of times a day. I now live in Salt Lake City where seafood comes in a can…bleh!